Am I too short to drive a 1989 k100 rs? K100-forum.com » General discussion » Am I too short to drive a 1989 k100 rs? I just recently purchased a 1989 k100 rs. I straddled the bike while at the P.O. home and was not able to touch great but my boyfrend said the seat was not all the way on. I’m 5’3. If it’s not a safe plan is there ways to lower it a bit? It may not look like it in the picture but it really is quite a bit lower. Overall height isn't the issue. Your inseam is. I love the look of your bike! I’ll have to work on finding that set up. Thanks! I love,the naked look. I bet it’s more windy on the freeway with all the extras removed. @Kathysresto wrote: I bet it’s more windy on the freeway with all the extras removed. You don't need to change the look of your bike; you just need to change the seat and its components. It isn't hinged so it uses different hardware than the standard seat, and it should have the tank surround as in this photo and the previous example. It will lower the rider approximately two inches. After that, good core strength and balance will help. Maybe boots with stacked soles and heels and a modification of the shift lever to work with one could be options. @Kathysresto wrote: I love the look of your bike! I’ll have to work on finding that set up. Thanks! I love,the naked look. I bet it’s more windy on the freeway with all the extras removed. 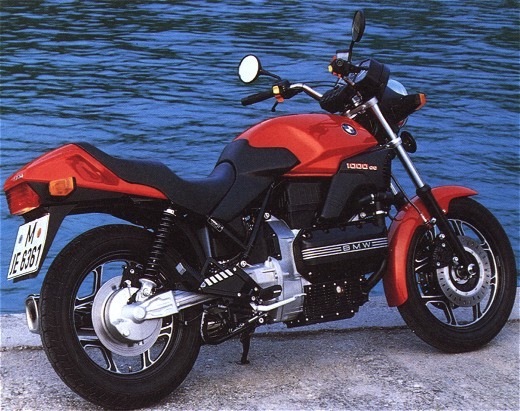 That's not my K100, just a low seat pic I found with Google. Thank you! Great suggestions. I’m glad you mentioned the shifter to consider for a good fit . Lots to consider. Dry nice looking bike! My favorite color, but I do love this white with dark blue on our bike. I can’t wait to clean it up. Those SEs have a great paint scheme. I'm usually not a fan of white vehicles but I think BMW did a great job with those RSs. 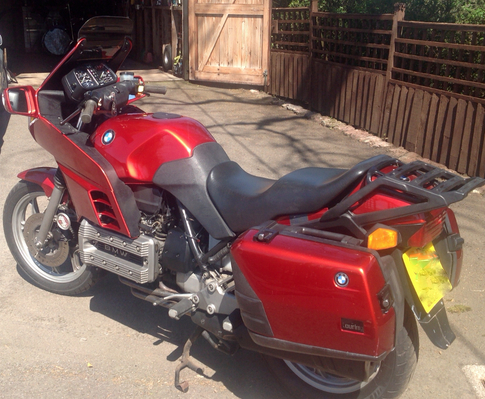 Buy a set of shoe lifts then buy a pair of motorcycle boots with the thickest soles you can find. Try the lifts in the boots before you buy them, not all boots will accept lifts comfortably. Next drop the forks through the trees you can go about 1/2'' without upsetting the handling. You can get a lower OEM seat or alternatively a good upholsterer that is experienced with motorcycle seats can shave your OEM seat. There is also a shorter rear shock available, but this will impact on corner clearance and make the bike harder to get onto the centre stand without modifications to the stand. @MartinW wrote: Buy a set of shoe lifts then buy a pair of motorcycle boots with the thickest soles you can find. Try the lifts in the boots before you buy them, not all boots will accept lifts comfortably. Next drop the forks through the trees you can go about 1/2'' without upsetting the handling. You can get a lower OEM seat or alternatively a good upholsterer that is experienced with motorcycle seats can shave your OEM seat. There is also a shorter rear shock available, but this will impact on corner clearance and make the bike harder to get onto the centre stand without modifications to the stand.